There are 18 medical college in Nepal, and five more are in paper works. Most have around 60 – 100 students enrollment for MBBS education every year. This is around 60 x 18 = 1080 (taking the minimum numbers) people applying to become a doctor. MBBS is Bachelor for Medicine and Surgery, compared to English Education, and MD level when compared to American Education. Average tuition fee for this degree is NRS. 2.4 million (1 USD = 87 NRS – March 28, 2013)), with some ranging up to 3.4 million for Nepalese for a five (or six) years of bachelor education. When I got enrolled, my parents payed NRS.1.2 million (it was relatively cheap then). After this we (MBBS graduates) still has to finish the Post Graduate level (Residency) in various specialization subject. The PG seats are rare, of about 300 seats per year. There are three university level examinations for Residency Seats within Nepal. Government affiliated TUTH (IOM) takes one which is valid for around one year, and applies to TUTH affiliated Medical College (some thing around 7-8 of them). Next is BPKIHS related Residency exams, for its own institution (semi-autonomous government affiliated). The last being exams from KU. My affiliated institution. Kathmandu University (KU) took an Residency Exam on March first week this year (here is the link). Around 400 – 600 of appeared for the various Residency subjects. Not Me. Results were out few days earlier, and quite wonderful that many of my friends got into it. Got into various Residency Seats offered by 7-10 KU affiliated Medical College. There was a written exam (MCQ) and then an interview. List of those who got into were published on KU website (result page) and then were asked to individual Medical College for Admission College. The list is arranged subject wise and then subdivided into individual school where he/she is being selected. There is also a waiting list (the all so important) for every subject. AS PER THE KUSMS WEBSITE (here) – its NRs. 2.2 million for Clinical Science based residency and NRs. 1.2 million for Pre-Clinical Science Residency. Nrs 2.2 million for a three year course in Clinical Medicine Subjects. We pay to practice. We get payed NRs.17,000 per months which sums up to Nrs.0.612 million. 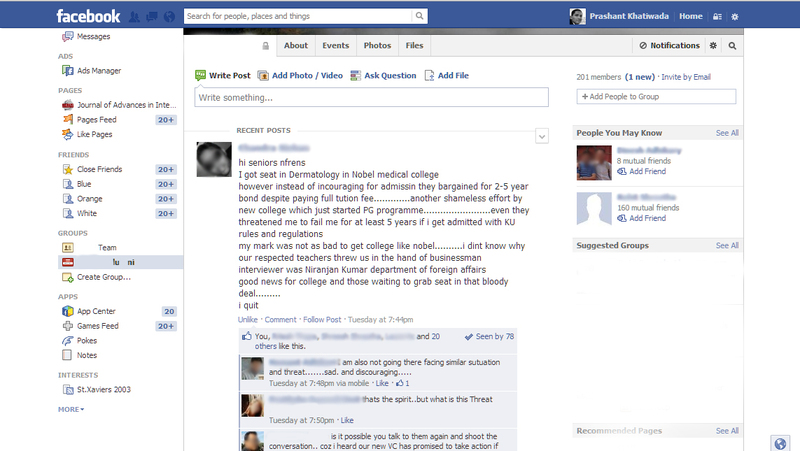 So in total – its like we pay a total of Nrs.1.48 to the medical college just to practice our residency. Something that is free in developed world. One reason I haven’t given the exam here, I ain’t got that kind of money (and not asking my parents – again). Once a student is selected by university for residency, he/she goes to the Medical College for admission. This is where the corruption begins, and I have known this for the last three years (you hear rumors, and stories). The 2.1 million NRs, is a fee set by the University (in this case KU) for a maximum allowed fee. This fee gets divided between the University and Medical College. A person now has to talk to Medical College to complete his admission – at which point there are three courses. THE GOOD and NON Corrupted WAY – After agreeing to pay NRS.2.1 million, he/she goes and gets his/her residency. Works hard for three years, and comes out with a new achievement. The college is happy, the student is happy, and University has nothing to say. THE BAD (corrupted) – The College bargains for extra money, or else threatens to call a candidate in waiting list. The bargain price is determined by the subject. The unconfirmed rumor up until last year was like highest for Radiology and Dermatology. The college is happy, but the student ain’t. University has nothing to say. THE UGLY (corrupted) – The College bargains for extra money and/or keeps the student for three to five years of bonding. Bond by definition is the stipulation by which a new resident must serve under the Medical College for the added amount if time after he/she completes residency. The college is happy, University is happy (good staff addition) but the student is not. abbreviation – BPKIHS = B.P. Koirala Institute of Health Sciences; IOM = Institute of Medicine; KU = Kathmandu University; KUSMS = Kathmandu University School of Medical Sciences; MBBS = Bachelor of Medicine and Bachelor of Surgery; MCQ = Multiple Choice Questions; TUTH = Trivhuvan University Teaching Hospital. disclaimer – i have no idea who the person in above Facebook comment is. He might or not be as corrupted as stated in the image above. The image above may or may not reflect the truth. I can be sued or accused of false accusation, and hence I say this post has few fictional component in it too, the detail of which I shall divulge only upon personal inquiry. Nonetheless, accusatory lawsuits are rare in Nepal. Most of the words here are my personal experience, except the image, which I copied and blurred some text (to hide names) before posting. I imagined being kicked out of an airplane for not putting on the seat belt, while flying above the Amazon river basin in one of the Brazilian – anaconda infested jungles. I never thought a first year surgery resident would be free enough to be a senate member on one of the private university in Nepal. Sujan “maka” is a very good friend, a great doctor, and a good human. I sincerely wish good for him, and hope he does well. As a friend, I am thrilled to have a person in the inside. Although, it may never help me, I now have the bragging right. That said, a part of me thinks this is crap. Nepotism at its height, and logically speaking he is unfit for the job. A first year surgery resident has to do 48 hours ward duty, 2 days of Out Patient Department (OPD) duty, and 2 days of Operation Theatre (OT) duty, leaving just one day on a week to study. If he/she is appointed as a youngest member of Kathmandu University, I definitely think that this is a greater burden for them. Plus, doesn’t that post require some kind of qualification or something? Can a working student doctor be catapulted to become a senate member for all the good reason. We studied MBBS together for five years, and despite of his good friendship, a personal judgment call from me, votes against this. Do I think that he was put there by his uncle (and family) as a prime example of nepotism? Yes. PS – I may be also a little jealous of him. Also as a human, I can’t imagine where would I have stood if the same offer came to me.